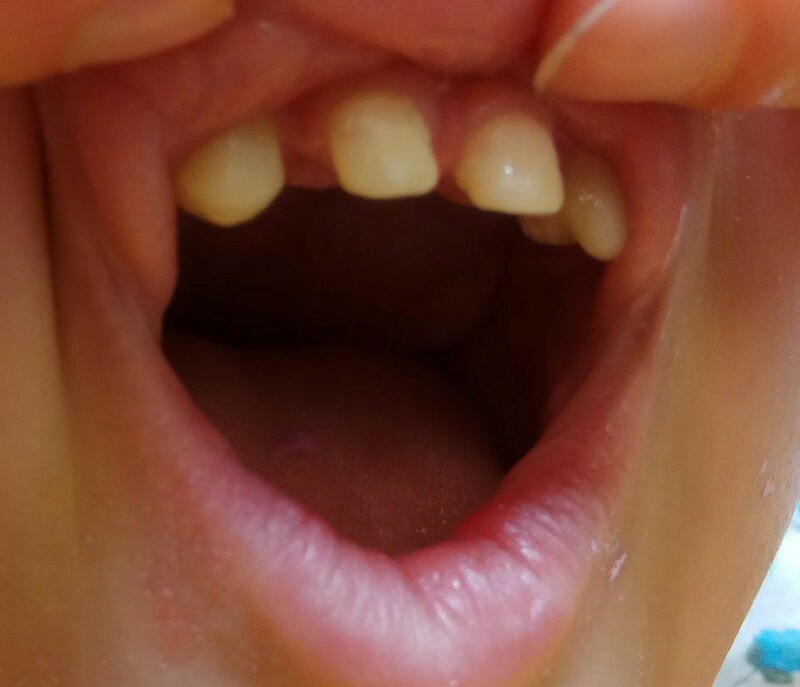 One of the main characteristics of Ectodermal Dysplasia, and the one on which a diagnosis is frequently made or proven, is the absence of some teeth (hypodontia) or malformation of teeth. Teeth that are present may be widely spaced, pointed, and in some cases the enamel is defective and discoloured. Many babies affected by Ectodermal Dysplasia do not have any teeth erupt until they are at least two years of age. For cosmetic, psychological and social purposes, as well as nutrition, teeth are desirable. 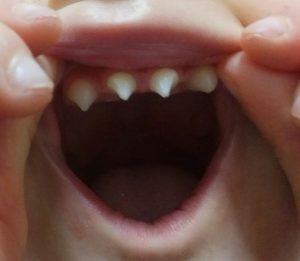 Should the child have pointed upper front teeth, it is relatively easy for the Dentist to build these up with an adhesive tooth-coloured material (dental composite) to make them appear squarer, around the age of 3 and ideally before they begin school. Even if there are still some gaps, having square front teeth as opposed to pointed/conical teeth will help prevent any bullying by their peers and will give the child a happy smile. Older individuals may be considered for implants or bridgework, but implants are not suitable for everyone and it is necessary to seek advice from an implant specialist. The Dentist’s chair may become a place where your child will spend a lot of time. It is important for the Dentist to get to know your child and vice versa before any treatment is commenced. Make sure your Dentist is prepared to spend time with your child to build up a rapport, to explain about the room and the tools, to show how the chair works, what he is going to do and most importantly, to have some fun. It is important to remember that whatever teeth erupt become precious; a tooth, no matter what shape or size, can be used by your Dentist to help with dentures, etc. Baby teeth, especially canine (eye) teeth, may last for several decades if there are no adult teeth behind them to dissolve the root and push them out. So, hang on to whatever grows and take extra care of them. Good dental hygiene is very important. If a non-specialist Dentist recommends tooth extraction, for whatever reason, seek a second opinion. Some dental hospitals have specialist teams to help patients affected by hypodontia, who can provide a coordinated treatment plan involving all the necessary experts. Ask your Dentist about being referred to one, if this facility is available in your area. If it is not available in your area some hospitals can, on occasion, treat Ectodermal Dysplasia patients from other regions. Ask to be referred to your nearest dental hospital for an assessment.